Ultra-fine bubbles are often called nano-bubbles in reality the nano-bubble doesn't meet the definition of a nano-particle so they are officially called ultra-fine bubbles. Bubbles are gas-filled cavities in water, the lifetime of a bubble is short at most a few minutes, only ultra-fine bubbles are stable for longer periods like months, that is making them very special and that enables us to change the properties of water. This opens-up innovation for agriculture, food processing, cleaning and medical applications. Bubbles are all around us, in our foods, beer, pop drinks bread and cheese, but also in the bricks of our house. The ocean is the biggest bubble generator in the world, when you smell the ocean, you smell the exploded bubbles and when walking on the beach the exploded bubbles make your hair sticky and give your sun glasses a fatty layer. On borders, new things are possible, this is the region where you go from one side to the other, this is especially true for bubbles where you go from a gas to a liquid phase, this is were all the magic in water happens. In the world of bubbles, we distinguish various sizes, the biggest are milli-bubbles then followed by micro-bubbles and the smallest we call ultra-fine bubbles. Bubbles consists of three main components a gas, a liquid and a shell an aqueous phase between the gas and liquid. The formation of the bubbles and the mechanical properties of micro-bubbles depend on the property of shell material. 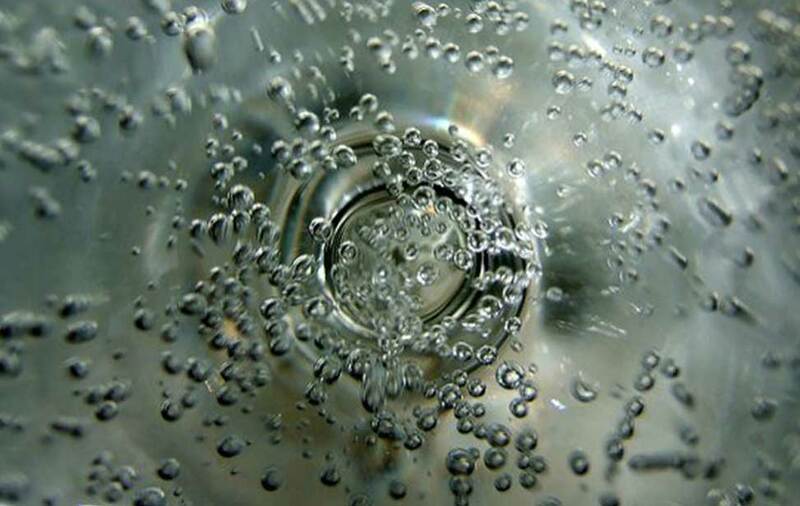 Ultra-fine bubbles are miniature gas bubbles in liquids mostly less than 200 nm in diameter and have several unique physical properties. A human hair has a diameter of around 180,000 nm which is a factor 900 bigger. Ultra-fine bubbles remain stable in water for a long time because of their negatively charged surface area, where milli bubbles increase in size, rise rapidly and burst at the water surface or the micro-bubbles dissolve in water before reaching the surface. Besides, the internal pressure of ultra-fine bubbles in liquids is higher than that of their environment, which accelerates dissolution of the gas into the liquids. This remarkable property to have, highly efficient gas solubility, we call super-saturation of oxygen gas in water. The nano size of bubbles has another benefit, by enlarging the gas contact surface in water, reactions with the environment are more likely to happen. In the medical industry reports show that high oxygen gas solubility of micro-bubbles is beneficial for oxygenation of hypoxic tissues. In cancer research, researchers experiment by giving the ultra-fine bubble a magnetic charge by doing so they are able use the ultrafine bubble as a drug delivery mechanisms by bringing the drug to the cancer cells via a magnet pulling it at the desired place. The first areas were ultra-fine bubbles will have an impact are agriculture and cleaning applications. Ultra-fine bubbles are smaller than the wave length of light, by being so small the bubbles can reach into the deep pores of any material, since the bubbles are negatively charged like a detergent they can float the dirt into the water away from the object. The real benefit of washing might be in the cleaning of fruit and vegetables, these tender products we don`t want to treat with detergents but we like the possible pesticides and bacteria and fungi being removed from the salads. Ultra-fine bubbles can play a large role in this process. In agriculture, ultra-fine bubbles show increased growth speeds and heavier crops. Plants needs 13 mineral nutrients from the soil and from the air and water it absorbs hydrogen oxygen and carbon to grow. Plants absorbs dissolved-oxygen via the roots from the water while carbon gets absorbed as CO2 via the leaves. In warmer climates were the water for plants is also warmer the water is often depleted from oxygen, when adding ultra-fine bubbles to the irrigation water oxygen deficiency is a thing of the past. In plant cultivation, a DO level of 8 mg/L we consider optimal, increased levels of up to 16 mg/L show slight growth benefits to the plants. When using ultra-fine bubbles, the growth benefits are larger than what can be explained by the DO levels only. The ultra-fine bubble is promoting additional plant growth. A lot of research and applications development still needs to be done, but an exiting new industry is coming up, creating sustainable environmental friendly solutions to enhance the properties of water.